A fathers' rights campaigner has admitted he was "lucky" to escape with only a fine after trying to disrupt the Queen's birthday celebrations. 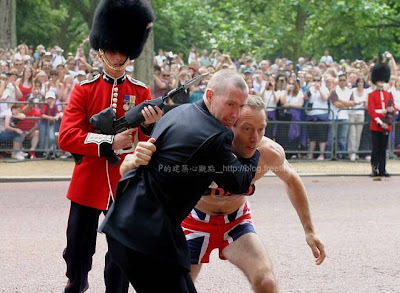 Jolly Stanesby was one of two Fathers 4 Justice activists arrested on Saturday after trying to halt the Queen'scarriage as it made its way down The Mall. Dressed only in Union Jack boxer shorts, Mr Stanesby, of Ivybridge, Devon, and fellow campaigner Tony Ashby from Leicester got over safety barriers lining the route as the Royal procession made its way from Buckingham Palace to see the Trooping the Colour Parade. 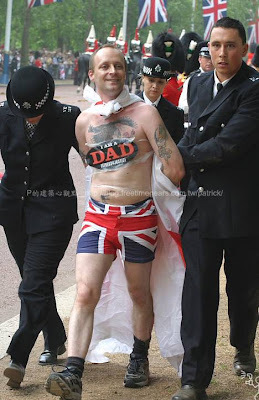 The protesters, arrested at around 12.30pm, were taken to a central London police station and charged with public disorder offences.Speaking yesterday, Mr Stanesby, 39, said he received an £80 fixed penalty fine for his actions, done to coincide with Father's Day. 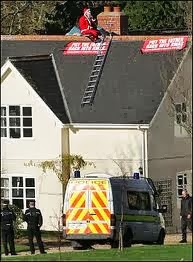 A spokesman for the Metropolitan Police confirmed two men had been arrested following the incident. However, he said: "They did not get anywhere near the Queen."